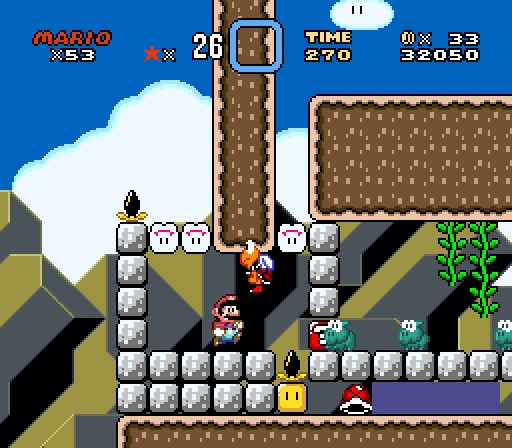 After spending sixth months in the Himalayans studying with the Masters of Super Mario World hacking, I have returned to bring you another level sampler of my hack Super Mario World: Alexandrite Edition. Once again, it's only six levels but two of them are brand new and some of the old levels have been slightly modified. Feel free to give feedback as well. 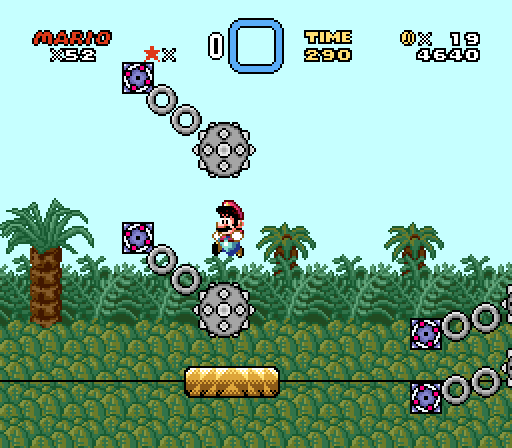 this hack was born out of my dissatisfaction with the previous hack i had been working on, also called Super Mario World: Alexandrite Edition. 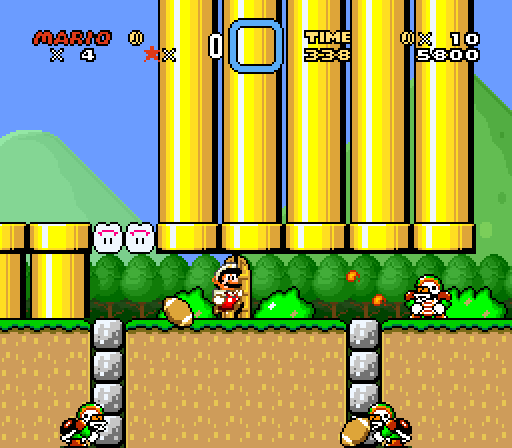 that hack, however, was trying to be more like an official mario game, whereas this hack is being made more like a collaboration hack, in which all of the levels will be made first before really making the overworld, and is more inspired by the works of the JUMP team and japanese hacks like the hyper mario series. i'm aiming for a very hard difficulty, but still in a way thats manageable. First of all—hey, glad to see you're still working on this! Anyway, something that I've notice throughout a lot of this hack is that while your levels aren't designed badly, you seem to have an issue with restraint. 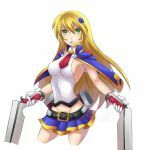 That is, while there are a lot of times where you capture that "hard" difficulty really well with some neat ideas in your design, there are also times where you seem to have the idea that difficulty comes from putting a lot of enemies. Don't get me wrong, it's definitely difficult to avoid a lot of enemies at a time, but I wouldn't really call that great design or fun to play. You can still accomplish difficult sections well with those same enemies while not using nearly as many sprites, it just requires more thought put into how the player will interact with that one (or two) enemies with surrounding obstacles. Still glad to see stuff from you regardless! Just keep working on that and you'll see a lot of improvements in your designs. i'll start off by thanking you for feedback. i think it's interesting, and this isn't trying to dispute your claims at all, just because, almost above everything else, i have tried to repeatedly test the obstacles in each of my levels as i develop them as to make sure they flow well and to avoid anything feeling spammy or just randomly placed though i suppose there's really no way to tell how your audience will feel about it. do you have any examples in particular? Quite a neat hack you've got there. It has that certain "JUMP" feeling, I think you were going for, with lots of interesting setups. I have to admit, I dind't play the hack savestate-less, although I'm pretty sure it is very doable (which I think you were going for). Starting of with "Falling for you": Probably my least favorite level out of the bunch, mainly due to the long waiting times on the "long-lasting-timed-lifts" completely interrupting the fast-action of the level. Try making the rides on these long-lasting-lifts a little more exiciting. 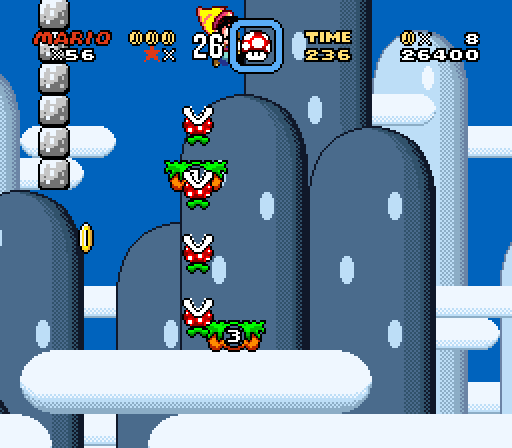 However especially the jumps over/under the piranha plants were very enjoyable. "Draft day": Decent level overall, with some really unique sections although a little too much on the football/football chuck side of thigs, for my taste. The setup, where you had to shoot the chuck with the fireflower stood out the most. "Spiky balls": First of great level name, very accurate xD. Overall rather enjoyable with the first half maybe being too much on the short and easy side. The very last jumps were the most memorable ones for me. "Slip slidin' away": I really love this level, contender for my favorite level out of these. These quick slide jumps are super fun. 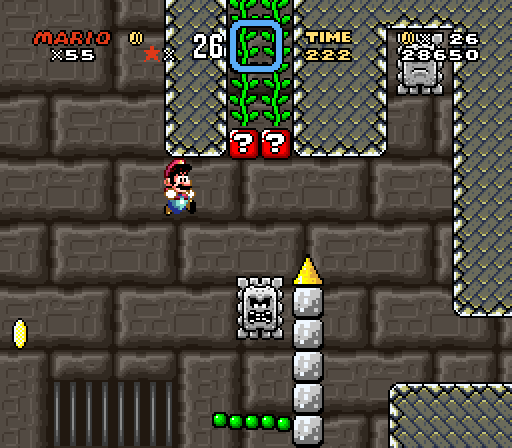 "Spring 'n things": While I really do hate these wall springs (they are way to finicky and hard to control) the level was still very entertaining for me. Just overall excellent enemy placement and interesting setups, only these wide jumps (e.g. very last jump) are quite annoying to make. "Dino-rhino ridge": The beginng and end of the level are well designed. Just the cave section feels a little slow and sameish to me. Hope at least parts of these quick thoughts are useful. Overall had lots of fun playing through the demo and I'll look foward to seeing more progress on the hack . I can say that I don't think that you need to improve your skills working again on those levels,because...perfection is not from this world(even SMW hacking world XD)so,the quality balancement of those levels is pure personal.I really like to give all I got to complete some levels,others may can prefer little fair thing.Because...some parts,were really unfair to me:is almost inevitable on ice level for example,to take some damange and the final two jumps before the finish line are really strict like a Kaizo Light...as ball chain level where you jump on right and you cannot evade damage from a ball,to avoid the fall in a pit. 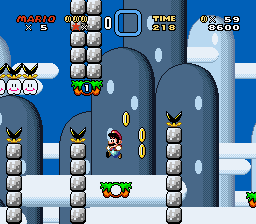 and this could be inserted because on ice level,you used an original SMW OST. An OK demo, it has a lot of creativity in it, and I like it, but some of difficulty comes from precise obstacles (like last tiny slope in Slip Slidin' Away). 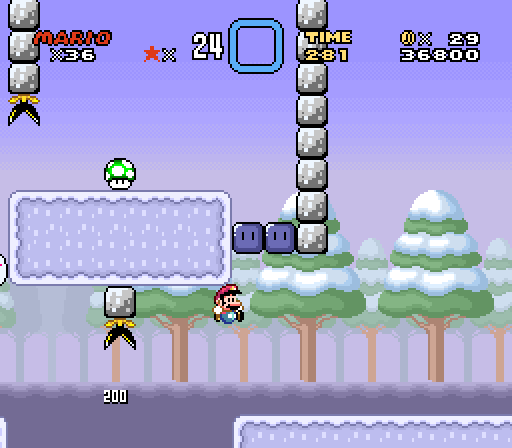 Spring 'n Things is a bit annoying at times, because of how wall springboards work. Falling For You seems to be the easiest level from this bunch, but this place is veeeeeery precise, especially when you decide to grab dragon coin. It's also unnecessarily long at times. C'mon, you just have to wait for platform to drop and then do a thing? Not very good. I don't have any gripe with other levels, they're as difficult, but I didn't found any issue in them. Overall, this hack is good, and if you fix balance issues, it'll become a very good hack. Keep up!